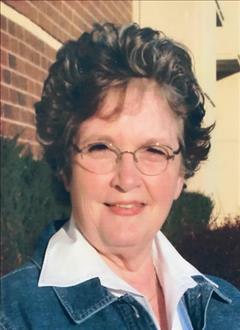 Donna Kaye Gold, a resident of Henryetta, passed away Friday, Sept 7, 2018 in Henryetta, OK at the age of 72. She was born Feb 8, 1946 to LaVerne William Potter Sr & Ima Gene (Luker) Potter. She was born & raised in Henryetta and graduated from Henryetta High School in 1965. Donna married Glenn Gold in 1965 and together they had 3 children. Donna worked at Wal-Mart for 30 years and retired in 2010. Sunshine, rain or snow, she was there. She wore many hats during her time with Wal-Mart. From cashier, to bakery, to receiving and answering phones, there wasn't much she didn't do. She made many life-long friends, co-workers and customers alike. She never knew a stranger. After her retirement, a typical Wal-Mart trip would be an all-day event. She just loved being around and with people. Donna found great joy in the simple things. She enjoyed reading a good book and going to church. She collected Denim Days Kids, sold AmWay, Tupperware & Home Interior and loved all things cobalt blue. Her biggest joy in life was spending time with her kids and grandkids. She was always game for a good tea party, building towers of blocks, playing in the ball-pit, or reading a bedtime story. Donna was a lifelong member of The First Church of the Nazarene. She was preceded in death by her parents, stillborn twin sons, brother-in-law, Henry Bezinque, niece, Gina Potter, nephew, Shane Potter, and brother-in-law, James Gold. Viewing will be from 12-8 on Tuesday, September 11, 2018 and from 8am-8pm on Wednesday, September 12 with the family present to greet friends at Integrity Funeral Service from 5-7pm. Funeral Services are scheduled for 2:00 pm. Thursday, September 13, 2018 at the First Church of The Nazarene in Henryetta with Rev. Tim Cole, officiating. Interment will follow at Westlawn Cemetery under the direction of Integrity Funeral Service. A special thank you to Transitions Life Care: you are forever our family.